I picked up this Caudalie Lip Conditioner whilst I was on holiday a few weeks ago… I’d left my Lanolips at home and was after something fairly inexpensive and easy to apply. I can’t detect a strong scent nor taste from this rather minimalistic-looking balm, it displays an impressive list of ingredients including beeswax, shea butter and grapeseed extract topped of with an SPF of 8. Caudalie is a French brand that I’m not hugely familiar with but I know that they place an emphasis on natural beauty and this product is no exception having been formulated with 99.5% naturally-derived ingredients. It keeps my lips in check under normal circumstances, but I haven’t needed to put it to any serious dryness tests as my lips are in OK condition thanks to my Lanolips. I do love how convenient and solid the Caudalie Lip Conditioner is… it makes for super quick on-the-go application with no risks of looking like you’ve dipped your mouth in goosefat. I like things like this that are scent free but still work nicely. Will definitely look out for this. 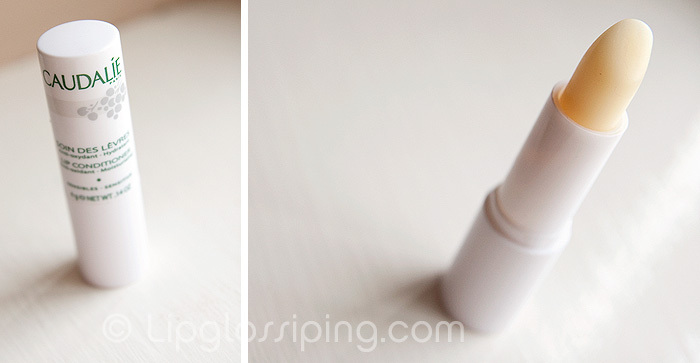 I use this lip balm and find it excellent – very moisturising and non-irritating. I have used it when my lips have been very dry and cracked (midwinter or midsummer) and have found it very good for bringing them back to bearable. I’d rank it up there with my Burts Bees, Badger Balm and Vinofit levres, though I don’t know if anything can ever part me from my Balm Balm for the ultimate performance.